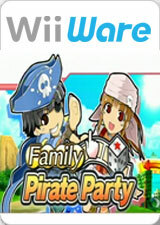 Get Ready To Plunder Like No Other in Family Pirate Party (Okiraku Sugoroku Wii in Japan)! Daddy, Mommy, Sarah, and Billy make their return as pirates sailing the seas and skies! Roll the dice and sail through the islands to gather the treasures each island holds. The person with the most gold at the end wins! Family Pirate Party shines with its appealing cel-shaded graphics and endearing music. Challenge up to three other players, be they friends, the CPU, or both, for some four-player board-game fun. Do you have it in you to defeat your opponents and become the king of Family Pirate Party!? The graph below charts the compatibility with Family Pirate Party since Dolphin's 2.0 release, listing revisions only where a compatibility change occurred. This page was last edited on 16 January 2018, at 06:15.